Underneath the streets of Istanbul lies the Basilica Cistern. There are hundreds of ancient underground cisterns in Istanbul but only two of them have been restored beautifully and are open for visitors. The Basilica Cistern is one of Istanbul's most popular tourist attractions and is reached by descending 52 stairs. There are 336 marble columns that support the huge underground chamber lined up in 28 rows of 12. Built during the 6th century by Byzantine Emperor Justinian the Great, the Basilica Cistern was used to store water for the Great Palace. This was because as Constantinoples population grew the city suffered from many water shortages. Later after the Ottomans conquered the city, the water was used to supply water to the garden at Topkapı Palace. Basilica Cistern Turkish Yerebatan Sarnici it is the largest of all cisterns. The most extraordinary feature of the impressive columns is the two giant Medusa heads, which are placed at the column bases. 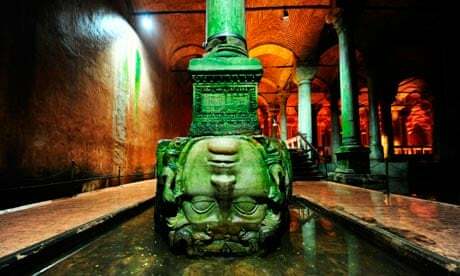 A Frenchman visiting Constantinople in the 1500s discovered the Basilica Cistern. He had heard unusual rumors of locals drawing up fresh water and even fish from holes in their homes cellars. Fascinated by these stories and the myths of vast underground temples, he decided to investigate. Thus he rediscovered the subterranean wonder, the largest of the long-forgotten cisterns of the Byzantine Empire. In 1963 the cistern was used as apart of the James Bond Film “From Russia with Love”. The cistern is illuminated with a soft lightshow and classical music. Located in the district of Fatih, close to the blue mosque. Daily between 09.00 and 17.30.